The small church of "Agia Paraskevi" is found in the south of the village, on the road between Galata and Kakopetria. It is a single-aisle church with a sidelong, rectangular chamber in the Holy Bema that is covered under the same roof with the temple. According to the Director of the Antiquities Department, Mr. Athanasios Papageorgiou, this chamber was intended as the sepulchral chamber of the church's founder or clergymen. The church's dimensions are 7,20 X 3,60 metres without the apse. The apse has a chord of 1,97 metres and an arrow of 1,66 metres. The walls of the church are made of unrefined stones and mud, and is 0,42 -- 0,50 metres thick and about three metres tall. There are frescoes only in the pediment. The Ascension of Christ is depicted and -under it -all around the arch, Stefan, the First Martyr. In the quadrant of the apse, the Virgin Mary is painted standing with her arms raised in a stance of Prayer and without Christ. On the left and on the right, the Archangels Michael and Gabriel. Under the Virgin Mary, the Saints Epiphanios, Athanasios, and John the "Chrysostomos" (meaning "man of Golden Words"), and north of the small window and in the south, the Saints Vasileios, Gregorios the Theologian, and St. Spyridon. 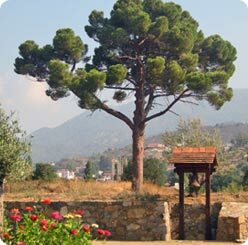 On the 26 th of July, the Saint's Day for St. Paraskevi, a service is conducted here in this small church.